Last week the glitz and the glitter returned to the ballroom as we welcomed a all new cast for season 18 of Dancing With The Stars. 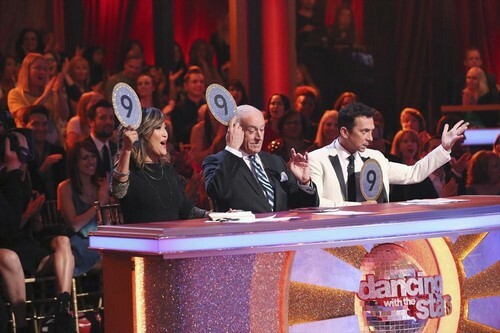 On tonight’s episode the dancing continues and we lose our first competition of the season. The show kicks off with a show-stopping opening number choreographed by Mandy Moore featuring the entire cast followed by an announcement that is not to be missed! Last week we met the fresh new cast and professional dancer pairings: Sean Avery & Karina Smirnoff, Candace Cameron Bure & Mark Ballas, Drew Carey & Cheryl Burke, Meryl Davis & Maksim Chmerkovskiy, NeNe Leakes & Tony Dovolani, James Maslow & Peta Murgatroyd,Danica McKellar & Valentin Chmerkovskiy, Diana Nyad & Henry Byalikov, Amy Purdy& Derek Hough, Cody Simpson & Witney Carson, Charlie White & Sharna Burgess and Billy Dee Williams & Emma Slater. The new contestants took on their first dances and there were some spectacular performances and some not so spectacular performances. Did you watch last week’s premiere episode? If you missed it we have you covered, right here. Did you miss any of the performances? If you did we have all the videos, right here. On tonight’s episode each couple will then perform a dance style of the celebrities choosing including Swing, Tango, Jive, Salsa, Samba, Rumba and the Cha Cha. The couples face the first nerve-racking round of elimination. Additionally, “The Switch Up” begins and voting guidelines will be revealed live. For the first time ever, America will be given the power to vote and change celebrity and professional dance pairings. Tune in tonight at 8 PM EST on ABC to watch the stars all hit the ball room. We’ll be recapping it for you live right here. In the meantime hit up our comments section and tell us who you are already rooting for! DWTS opens up with the message, “This Changes Everything,” and then the show kicks off with its opening number choreographed by Mandy Moore. The surprise this week is that all of the couples showed up tonight and expected to compete. But this is the surprise, tonight they are having a double elimination. The double elimination could take place any-time tonight.